In April of this year, the Inna Art Spacewill present “Re-Image”, an extended engagement with image media and theirmodes of display inviting relevant practitioners from China and around theworld to gather and exhibit their work continuously for a period of two weeks.The project aims to exhibit and promote work made in image media and to providea platform from which to further examine and discuss this, thus stating thecase for image media based art. Synopsis：In the film, the protagonist draws the water in his memory on a blank canvas. In the memory, he goes back to his childhood when he led an idyllic life, and in those days, he had an infinite yearning for the distant place. Today, he feels unwell when living in the urban area haunted by noisy sounds and unsavory breaths. The moonlight and autumn scenery in the ancients’ paintings have been replaced by the mechanical landscapes in the cities. In what direction will we drift if we go on another long journey? 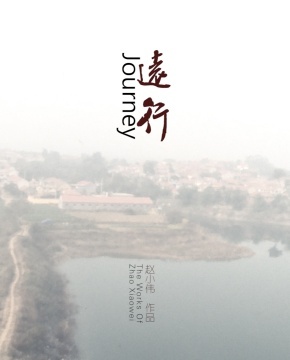 Director’s Statement: The short film Journey gets its title from “In the eternal world, man is a traveller, who can’t stay in a place for long”, a verse selected from The Nineteen Ancient Poems. This is an age of busyness. When we come and go in haste, our hometown gradually becomes strange to us, but the distant place is still unreachable to us. Urban life has brought convenience to people, but because of it, people often feel at a loss. Everybody that lives in it has to rotate around it. The movie tries to tell an individual’s feeling of wandering, as well as how he gets lost in the desert of time and seeks for the opposite bank. Time and time again, he returns from an alien land to his hometown and then leaves. When coming to and fro, he, with bright hope within himself, goes to look for the “Utopia” in his heart. That’s the gradually blurry native land and childhood of ours, and the “the Peach Garden” we’re seeking but can’t find.